Sugar Refinery gives the moderate bonus to the trade, which is greater in the warmer summer season, but also are not very low in winter since the sugar plantation are mostly in the warm middle eastern regions. It also gives a slight health bonus to the province. During the Muslim Agricultural Revolution, Arab entrepreneurs adopted the techniques of sugar production from India and then refined and transformed them into a large-scale industry. Arabs set up the first sugar mills, refineries, factories and plantations. The Arabs and Berbers diffused sugar throughout the Arab Empire and beyond across much of the Old World, including Western Europe after they conquered the Iberian Peninsula in the 8th century AD. Crusaders also brought sugar home with them to Europe after their campaigns in the Holy Land, where they encountered caravans carrying "sweet salt". Crusade chronicler William of Tyre, writing in the late 12th century, described sugar as "very necessary for the use and health of mankind". The 1390s saw the development of a better press, which doubled the juice obtained from the cane. This permitted economic expansion of sugar plantations to Andalucia and to the Algarve. The 1420s saw sugar-production extended to the Canary Islands, Madeira and the Azores. In August 1492 Christopher Columbus stopped at Gomera in the Canary Islands, for wine and water, intending to stay only four days. He became romantically involved with the Governor of the island, Beatrice de Bobadilla, and stayed a month. When he finally sailed she gave him cuttings of sugar-cane, which became the first to reach the New World. The Portuguese took sugar to Brazil. Hans Staden, published in 1555, writes that by 1540 Santa Catalina Island had 800 sugar-mills and that the north coast of Brazil, Demarara and Surinam had another 2000. Approximately 3000 small mills built before 1550 in the New World created an unprecedented demand for cast iron gears, levers, axles and other implements. 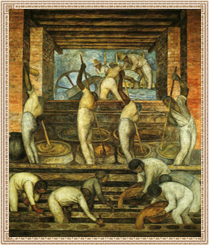 Specialist trades in mold-making and iron-casting developed in Europe due to the expansion of sugar-production. Sugar-mill construction developed technological skills needed for a nascent industrial revolution in the early 17th-century.